Brad Tolson, a native Tucsonan, first played organized sports at Manfeld Junior High where he was involved in baseball, basketball and touch football. 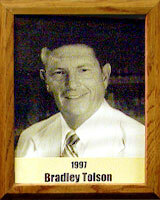 Baseball and basketball were his sports at Tucson High where he played for Hall of Famers Hank Slagle and Bud Doolen. Two more Hall of Famers, Chuck Hollinger and Andy Tolson, were his American Legion and “at home” coaches. Both Andy and Brad played for the University of Arizona when Pop McKale was coaching baseball. Brad lettered four years for the Wildcats, and at one time had 17 consecutive wins as a pitcher. The first-ever post-season district playoff game that the UA participated in was against Texas in Austin in 1950. Brad pitched and the Wildcats won 4-2. He played semi-pro baseball in Santa Ana, N.M.; Alexandria, MN; Minot, ND; and Fairmont, MN. While stationed in Tucson during his military service in 1953, he had a short stint with the Tucson Cowboys. Brad’s coaching duties covered several years with the Senior Little League and Colt League, and for 10 years he coached the baseball team at Pacific Coast Baptist Bible College in San Dimas, CA. He currently plays hardball three times a week with the Tucson Oldtimers baseball team.